With a product touted as the world’s slimmest and lightest 10-inch tablet before you, your first reaction is to note the record attributes. A depth of just 0.3 inches and a weight of merely 1.23 pounds are very impressive aspects indeed. Almost immediately, though, an overriding apprehension grips you: Will the device skimp on overall performance as a result? Thus is the interesting case of the sleek Toshiba Excite 10 LE tablet. Only a detailed hands-on review will determine whether buyers should truly get their hands on the device. In the appearance stakes, expectedly, the Excite 10 LE is a winner all the way. The chassis is a smart amalgamation of silvery magnesium alloy and lustrous ridged plastic imparting an upmarket look to the tablet. Owing to its nearly skeletal dimensions and heft, the tablet is exceedingly comfortable to hold and operate, even with one hand. Even so, the construction feels solid enough with no tangible creaks and hollowness. The Excite 10 LE sports a commendable number of physical controls and ports contradicting its minimalist exterior. You get a microSD card slot, a micro USB (2.0) port, an HDMI-out port, a 3.5- millimeter headphone jack, and of course the power and volume switches – all styled elegantly and within easy reach. The display can make or break a tablet’sreputation. Fortunately Toshiba have equipped the Excite 10 LE with a thin film transistor LCD touchscreen having a top resolution of 1280 by 800 pixels. As a consequence you get sharp definition, dense blacks, and praiseworthy contrasts. However one gets the impressions that the colors are not as rich as those found in the displays of other reputable tablets. The screen’s Gorilla Glass sheathing affords it extra protection but also, regrettably, heightens the display’s reflective properties thereby impairing the visuals intermittently. The capacitive touchscreen function is reliably efficient and receptive. The attendant Android virtual keyboard is a welcome inclusion with large and responsive keys. You also have the option to use Swype or download and operate SwiftKey 3, the popular keyboard application. 1. The Excite 10 LE is armed with a reasonably fast 1.2 GHz dual-core TI OMAP (4430) processor and a commodious 1GB RAM. These factors lend the device good application-running speed and decent multitasking abilities. However, the tablet struggles a bit when it comes to operating power-hungry games and flash-enabled online content. 2. Android’s complete Ice Cream Sandwich (4.0.3) operating system is on board. This makes the device exceptionally versatile and user friendly. You also get access to resourceful app pools and software like Google Play, Toshiba App Place, Crackle, Kaspersky Anti-Virus, and Book Place. 3. The Excite 10 LE comes with a capacious 16GB of internal flash capacity that is effortlessly expanded to 64GB via memory cards. 4. The miniscule tablethouses a 6690-mAH battery with a25-watt hour configuration; this gives it a below average sustenance power of around 5 hours on a single charge. 5. For connectivity, the tablet contains Wi-Fi (B/G/N), GPS, and Bluetooth – besides the micro USB option mentioned earlier. 1. The Excite 10 LE encompasses a 5-megapixel rear camera rendering acceptable outdoor quality – the images are clear with good color output. However, the in-house performance is not as noteworthy with the occasional dull image and irksome camera noise. The acceptable 1.3-megapixel front camera is useful for video calling. 2. The camcorder function can generate 1080-pixel HD movies at a quick 30 frames per second. 3. The tablet also sports a multimedia player equipped with SRS sound that can play all recognized file formats like MP4, H.264, DivX, WMA, and AAC in high definition and quality. The Toshiba Excite 10 LE bears a high price of roughly $530. 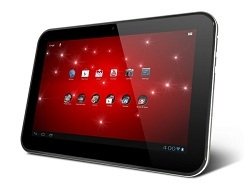 Still the tablet has the wherewithal to excite buyers looking for a sleek, chic, and fairly competent all-round tablet. This guest post is brought to you by Sandy Coops of www.cabletimenc.com, a site that offers savings and current information on time warner cable nc.